Germany, Switzerland (2014) 82 min. Gottfried Boehm is one of the most important contemporary German architects. His fame is based on the creation of of sculptural buildings of concrete, steel and glass, some of which are counted among the architectural icons of the 20th century. As the son of Dominikus Boehm, he is the patriarch of a dynasty of architects to which his sons Stephan, Peter and Paul Boehm have also belonged for a long time. 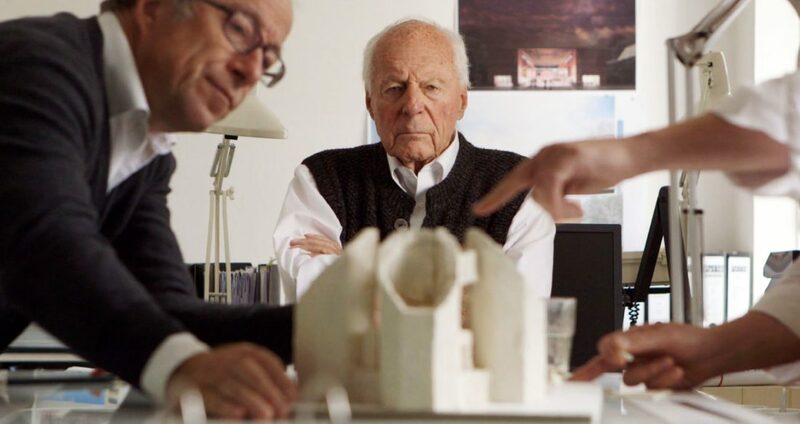 94 years old today, he still works daily on the development and construction designs of his office. When Gottfried Boehm’s wife Elisabeth, also an architect and the major source of inspiration for all four Boehms, died a few years ago, the family was robbed of its emotional centre. Leipzig, Internationales Leipziger Festival für Dokumentar — und Animationsfilm, Dokumentarfilmpreis des Goethe Instituts 2014.